Getting Crafty with Jamie: Fall fun! 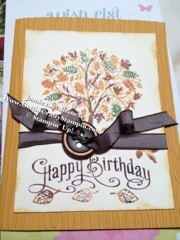 I had some Stampin' girls due at my home to play... One showed up and we had some one on one time. She was checking out my retired stamps... This one concerned her as she didn't know how she'd use it. We started with an ink and Marker technique. We stamped the tree in More Mustard and then used Garden Green, Bravo Burgundy, Rose Red Nd Chocolate Chip Stampin' Write Markers to color in a variety of the leaves, the trunk... I had her Huff on the stamp to remoisten it we stamped it on Very Vanilla paper. The Perfectly Penned greeting stamp set was a perfect fit. She did this in the Chocolate Chip ink from the Stampin' Write Marker. A fun card that goes for the LNS challenge this week! Fall in love with fall y'all! Have a Fun Fall Day!! Great card! Love the colors. The colors are beautiful, but what I really like is your ribbon treatment - and that brushed bronze button!